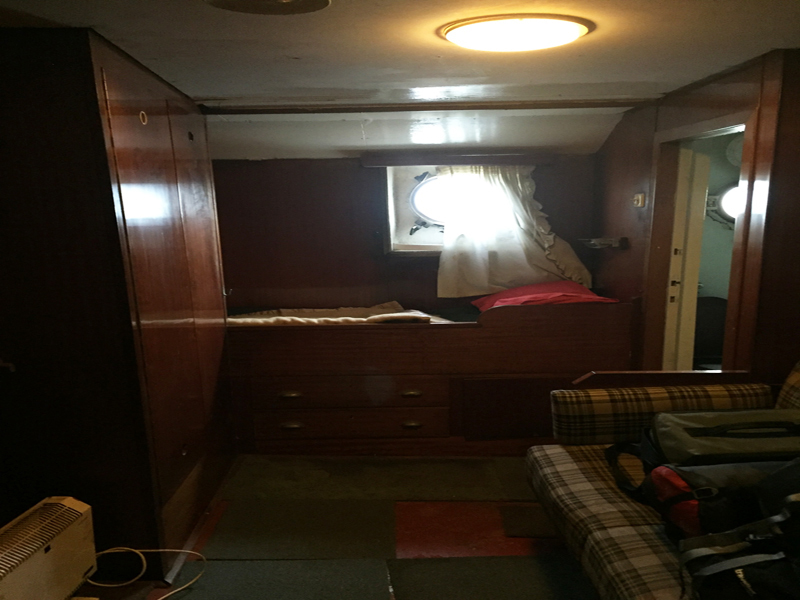 Located on main deck level adjacent to the ships Galley and Engine Room, the Chief Engineer cabin was, and still is, the only accomodation onboard the Ross Revenge that was afforded the luxury of an en-suite WC / Shower Room. The Chief Engineer was responsible for just about everything to do with keeping the ship kept running and for all associated maintenance tasks. In many jurisdictions the Chief Engineer, even to this day, is of equal rank to the ships Captain ..... with the Chief Engineer taking responsibility for the Engine Room and the ships Captain taking responsibility for Navigation. Over the years the Ross Revenge has seen some very talented engineers grace her decks. For Radio Caroline transmissions, Peter Chicago is deeply written into the ships history - but for all things mechanical and engine room related most notable are Ernie Stevenson (past) and the current Chief Engineer, Peter Clayton. Sadly, Ernie Stevenson passed away in October 2001 - the video below shows Ernie at work on the Bridge during one of the times the Ross Revenge was adrift and in need of assistance.